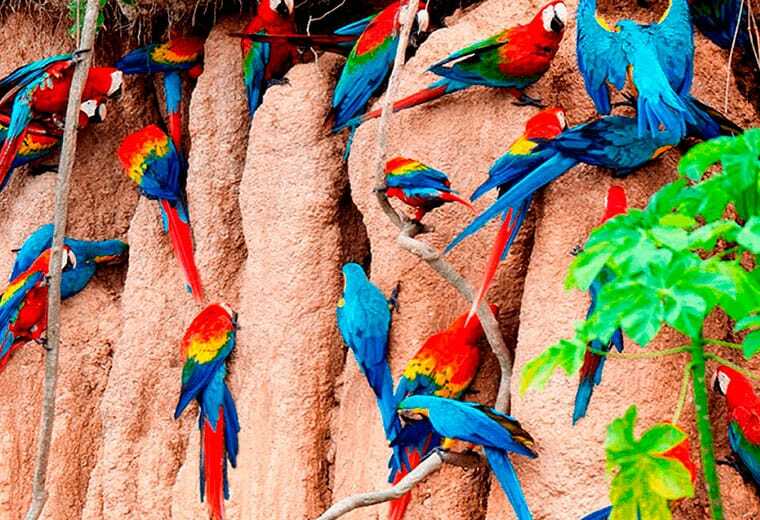 Visit the Amazon jungle, the most extensive and varied nature reserve on Earth, with abundant botanical and zoological species, visit exuberant landscapes where you can find encounters with wildlife and nature. 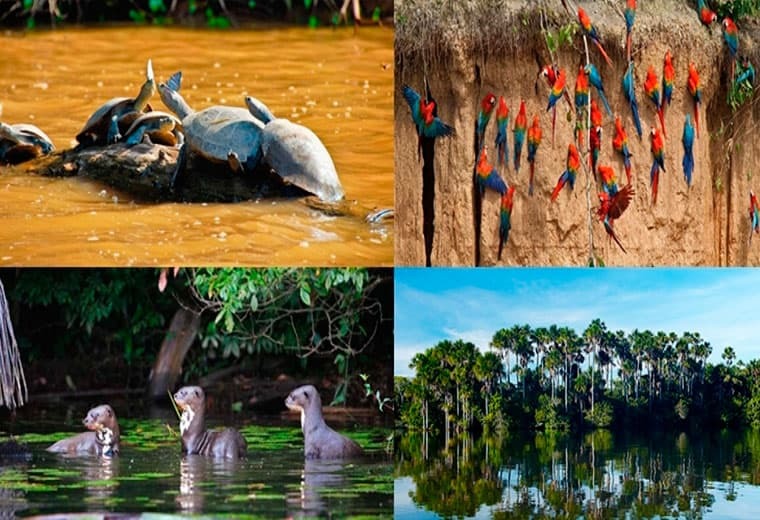 On this tour you can see the greatest biodiversity in the world, walking among the leafy branches, macaw parrot colpa, toucans, camungos, Shanshos (Hoatzin, which is a type of prehistoric wild chicken), herons and other animals, such as Caimans, Turtles, insects, animals and go into the exotic jungle and, above all, ENJOY THE LANDSCAPE THAT THE AMAZON NATURE! A representative will wait for either at the airport or at the bus station. Then the tour starts with a visit around the city, on a bus. After the visit we will head to Puerto Capitania, to board our riverboat and navigate on Madre De Dios river along the ride we might see animals in their natural habitat like Ronsocos, Caymans, Turtles, Cormorants. Arriving at the Eco Amazonia Lodge, you will get settled in a bungalow and we will have lunch together in our lodge. Past lunch, your tour guide will take you to Cayman Cocha, a small lake with the abundant presence of black Caiman (melanusuchus Niger) and Caiman (Caiman crocodilus). 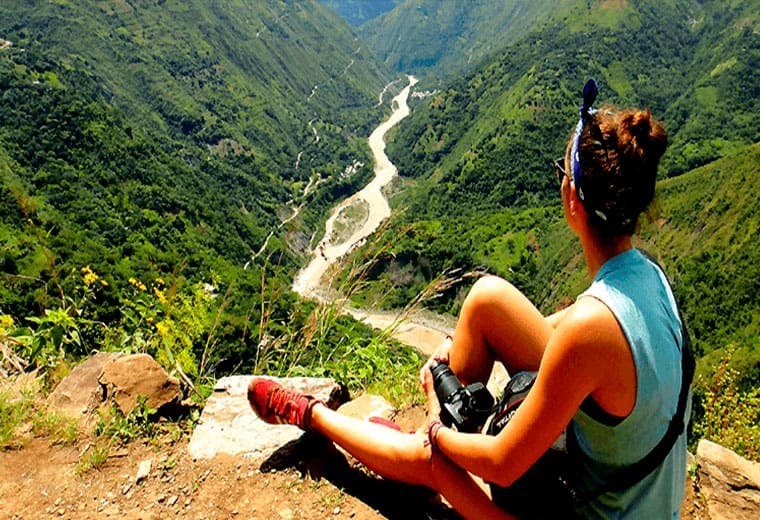 In the afternoon you will enjoy the sunset in the Amazon of Peru! Then you will go back to the lodge in order to enjoy your delicious dinner then you have free time to share your experience! 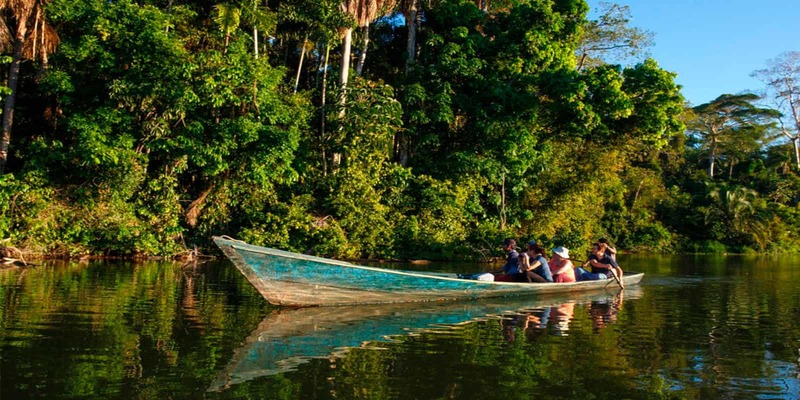 After a good breakfast we will start with our hike to the depths of the forest, during the journey we will see the flooded forest and variety of flora and fauna, then we will see the majestic lake Apu victor with its crystal water surrounded by big trees and marshes. In order to have a panoramic view and see more animals of the lake, we will go to the observation deck in a good day we can see the giant otter, a spectacular animal of the rainforest. After this amazing place, we will go back to the lodge to enjoy our lunch. After lunch, we will visit Monkey Island, which is located five minutes away from our lodge. This island keeps a variety of monkey species, in their natural habitat Maquisapas, Capuchins, Small Lion Monkeys, Frailes, Cotos and other animal species like the Coati and Sloths and a great variety of birds. After enjoying this beautiful island, we will go back to the lodge, we enjoy our dinner a rest. After a nutritious breakfast we will start our adventure, hike in the deep jungle to get to the lost Cocha this lake is a refuge and feeding for a huge variety of animals here you will have opportunity to see Otters, Caimans, Turtles, Sachavacas (Tapirs) Birds with multicolored feathers, the majestic Jaguar and a variety of fish species. 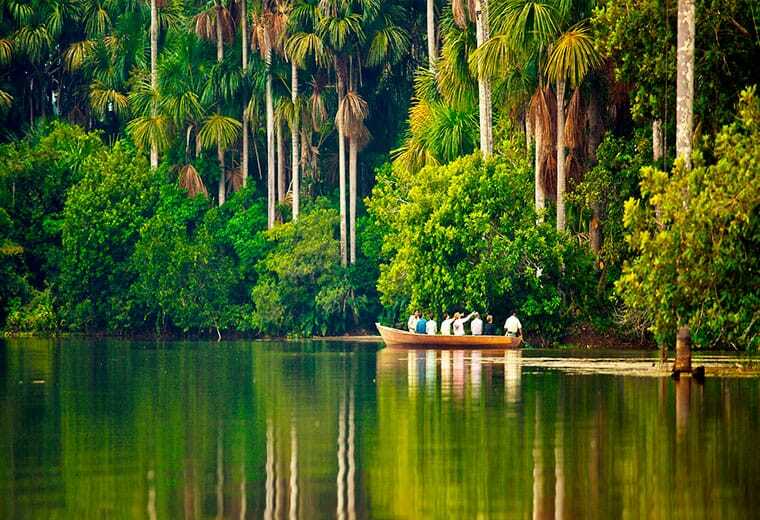 This area is unique and proper to the Eco Amazonia’s Ecological Reserve which maintains it intact, with huge swamps and diverse “aguajales”. 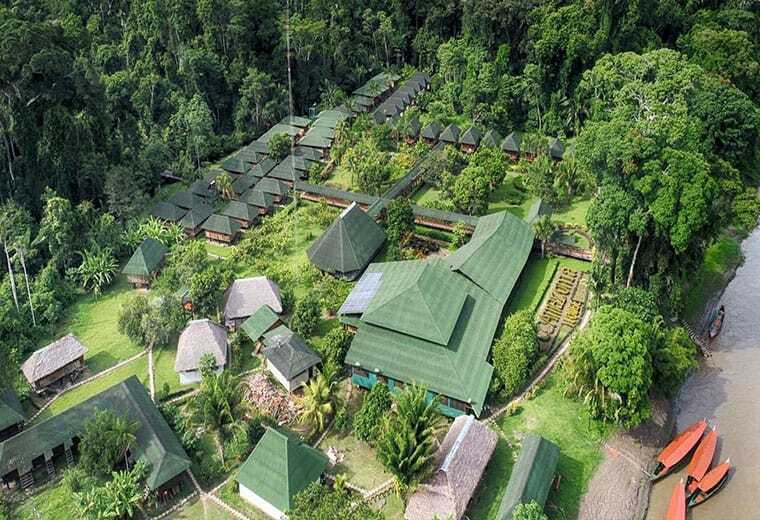 Then we will go on the observation deck, from where we can observe the immense rainforest after you enjoy the view you will have a nice canoe ride around the lake then we will go to our lodge for lunch. Then, we´ll get to the extraordinary Observation Deck, from which we´ll be able to appreciate the immense and magical rainforest. Afterward, we´ll have a pleasant canoe ride around the lake and will return to the lodge for lunch. After a good rest in our lodge, you will have your last breakfast afterward you will return to Puerto Maldonado. I recommend this company because they can customize your trips according to your availability and most importantly they are very professional.